The publication of Ruebner’s poems in April 2014 correlated with an upsurge of violence in Israel and Gaza. Although coincidental, this correlation lends the collection special urgency. The fighting increases in intensity, and like Ruebner’s repetition, retaliations beget retaliations. Awarded the Israel Prize in 2008, Ruebner is prominent not only in Israel but also in Europe, particularly Germany. Yet Ruebner’s work has been translated into English far less than other Hebrew-language Israeli poets, such as Yehuda Amichai, Natan Zach, and Dan Pagis. 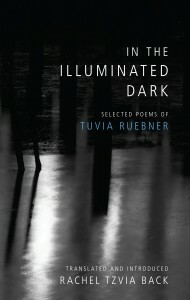 With the fortunate publication of In the Illuminated Dark, English-language readers can now read Ruebner in Back’s skillful, stunning translations and discover the poet’s empathy, humanism, humor, and compassion for the self and the other in poetry that transcends the dialectic of offensive and defensive, of us versus them. Order your copy of In the Illuminated Dark here.